Doug: December 14th of this year will be my last day at CMD. It's�been a long, sometimes bumpy but often rewarding journey. I'd like to thank those of you whom I've considered distant friends for the time we've spent together. I'd also like to thank the community as a whole�� without those of you who have supported the Commodore platform for so long, so many great memories would have never been. The first big Q-Link bash. The look of appreciation on Dave Haynie's�face when first saw the CMD HD and blurted out something about how he wished Commodore would make products like that. The night in New York where I�sat having drinks with Gail Wellington, never realizing until much later that the guy at the table buying me drinks and telling dirty jokes all night was the father of Pong. The moments in the wee hours of the morning when the silly things that pop out of your mouth are the things that actually end up making a product work. All priceless. And the people. I�think back not only to meeting Jim Butterfield, Jim Oldfield, Fender Tucker, Lou Wallace, Fred Bowen, Lauren Lovhaug and a host of other Commodore luminaries� but also to the user group meetings in Chicago, New York, New Brunswick and Phoenix, and the shows in Pennsylvania, Toronto, New York and Los Angeles where I�met so many other Commodore users, all just doing their own thing. Those are the folks that had the most impact on my input to our designs. My sincere thanks to all those who have so warmly befriended me in these brief encounters over the years. And to Gaelyne, Maurice, Shari, Jim, Jason, Steve and the rest of the original Commodore World gang, words can't express my gratitude for all your efforts and your friendship over the years. And so I'm moving on, but not so much because CMD no longer produces Commodore products, but simply because I�don't see myself doing the �local PC repair shop� thing for the next few years. I'm a developer at heart, and there's�little of that to be done at CMD these days, aside from some occasional web work. So I've taken a position as the Web Programmer for Hampshire College, a liberal arts school located in Amherst, MA, where they've just committed to a major update to their www presence. I'll still be doing some web programming for CMD here and there, and continue to develop web and other programming projects with Del Padre Visual Productions (take a peek at delpadre.com if you're interested and have a PC with an up-to-date Flash plug-in). For those of you who may wish to contact me in the future, I�suggest using my dcotton account at dougcotton.com. I'll keep some forwarding on some of my CMD accounts for a little while, but eventually those will be phased out. Again, thanks to everyone in the community. I'll remember this era of my life fondly for all the years to come. Best of luck in everything throughout the future, and rest assured I'll still be hanging around the newsgroups and keeping an eye on things Commodore-related as time permits. Visit Doug's�website at http://www.dougcotton.com. CMD's�official site does not mention their Commodore products any longer, but you can visit the inofficial page at http://www.cmdweb.de. 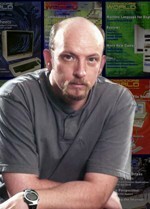 CMD's�products are still made and available, as Maurice Randall took over the production: http://cmdrkey.com. This article has been displayed for 1638 times, since publishing.